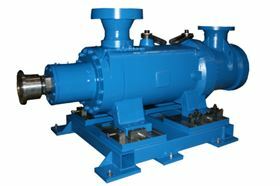 The Imo®8L-912Y pump can be installed on pipelines up to 24 inches in diameter and can cost-effectively transport more than 85,000 barrels of oil per day at pressures to 2,000 lb/in2. The Imo 8L series of rotary positive displacement screw pumps are more efficient than equivalent centrifugal pumps, lowering pipeline operating costs by nearly 30%. HMS Group Plc has signed a €9 million contract to produce and deliver API 610 oil refining pumps for an oil refining plant in Western Siberia. SPX Flow is supplying pumps to two US midstream pipeline projects – the Midland-Sealy Crude Oil and Condensate Pipeline, and the Sand Hills NGL Pipeline.